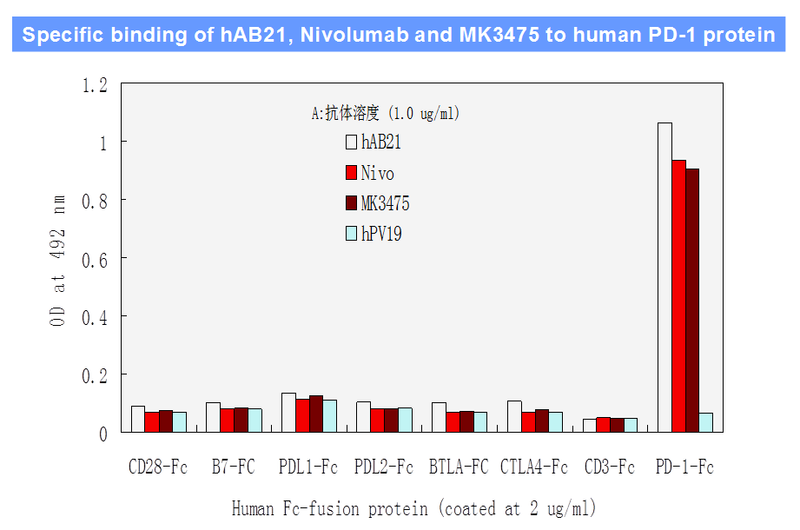 Fig.1 Anti-PD1 mAbs（hAB21, Nivolumab, Keytruda-MK3475) or anti-VEGF mAb (hPV19) were added into 96-well ELISA plates pre-coated with PD-1-Fc or other related protein as indicated; the bound mAbs were detected by HRP-goat anti-human IgG-Fab antibodies and OPD. Fig. 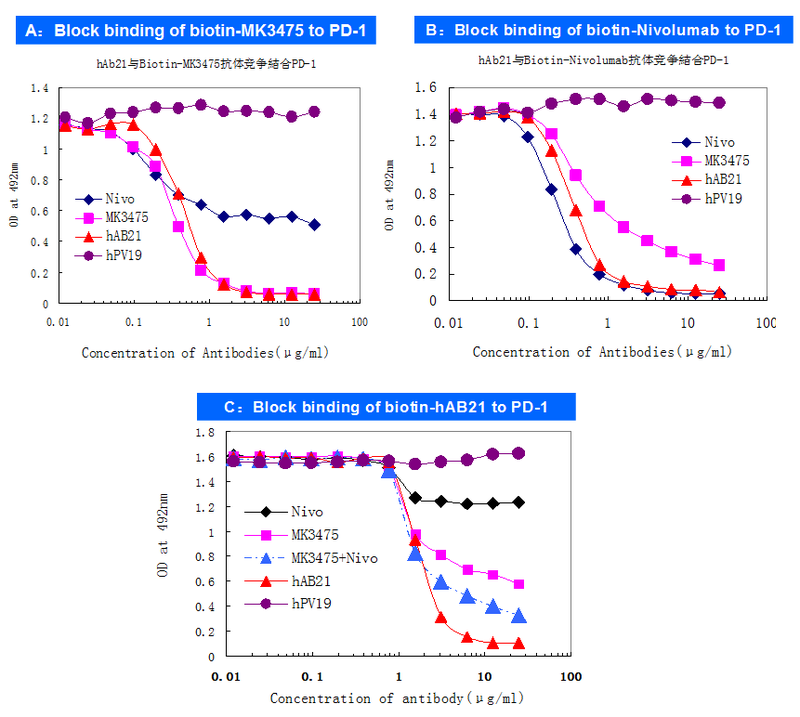 2 Various amount of anti-PD-1 mAbs（mAB21, Keytruda-MK3475）or anti-VEGF mAb (hPV19) were co-incubated with fixed amount of biotin-PDL1-Fc protein (A) or biotin-MK3475（B) and then transferred into 96-well ELISA plates pre-coated with PD-1 protein; bound biotin-protein or mAb were then detected by adding Avidin-HRP and OPD. Fig. 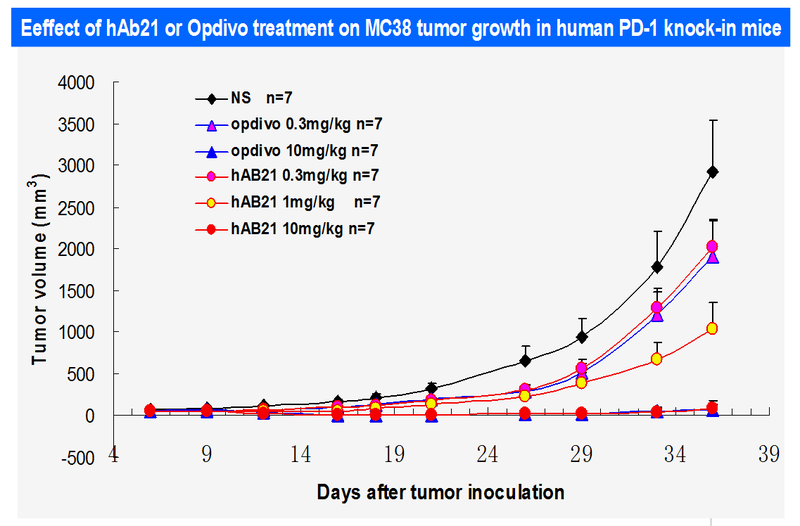 3 Various amount of anti-PD-1 mAbs（hAB21, Nivolumab, Keytruda-MK3475）or anti-VEGF mAb (hPV19) were co-incubated with fixed amount of biotin-MK3475 (A), biotin-Nivolumab（B) or biotin-hAB21（C) and then transferred into 96-well ELISA plates pre-coated with PD-1 protein; bound biotin-mAbs were then detected by adding Avidin-HRP and OPD. 1. Topalian SL, Weiner GJ, Pardoll DM. Cancer immunotherapy comes of age. J Clin Oncol. 2011; 29:4828-36. 2. Pardoll D, Drake C. Immunotherapy earns its spot in the ranks of cancer therapy. J Exp Med. 2012; 209:201-9. 3. Page DB, Postow MA, Callahan MK, Allison JP and Wolchok JD：Immune modulation in cancer with antibodies. Annu Rev Med 2014；65:185–202. 4. Chen L. Co-inhibitory molecules of the B7-CD28 family in the control of T-cell immunity. Nat Rev Immunol. 2004; 4:336-47. 5. Suntharalingam, G. et al. Cytokine storm in a phase 1 trial of the anti-CD28 monoclonal antibody TGN1412. N. Engl. J. Med. 2006; 355, 1018–1028. 6. Quezada SA, Peggs KS. Exploiting CTLA-4, PD-1 and PD-L1 to reactivate the host immune response against cancer. Br J Cancer. 2013;108:1560-5. 7. Flemming A. Cancer: PD1 makes waves in anticancer immunotherapy. Nat Rev Drug Discov. 2012; 11:601. 8. 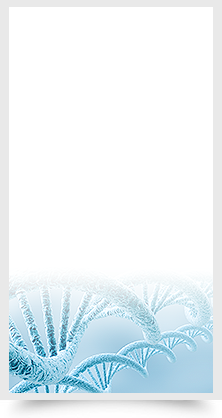 Ishida Y, Agata Y, Shibahara K, Honjo T. Induced expression of PD-1, a novel member of the immunoglobulin gene superfamily, upon programmed cell death. EMBO J. 1992;11:3887-95. 9. Agata Y, Kawasaki A, Nishimura H, et al. 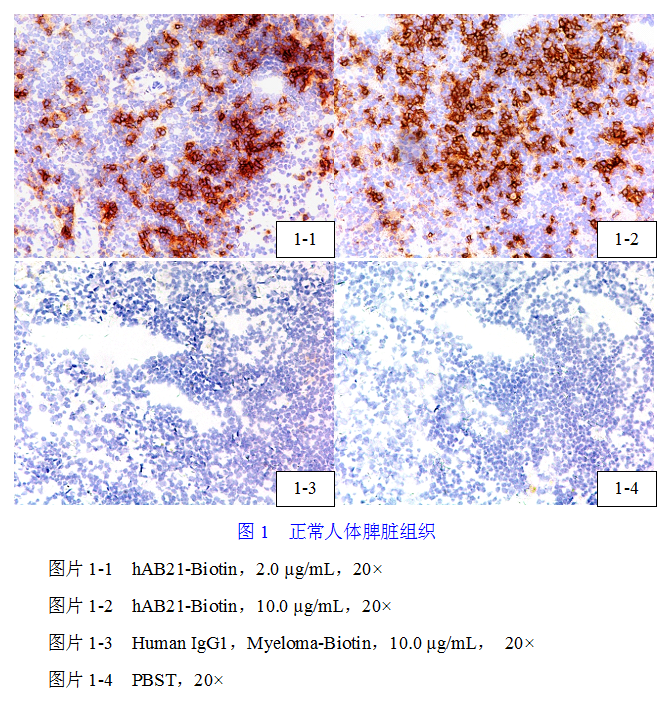 Expression of the PD-1 antigen on the surface of stimulated mouse T and B lymphocytes. Int Immunol. 1996; 8:765-72. 10. Freeman GJ, Long AJ, Iwai Y, et al. Engagement of the PD-1 immunoinhibitory receptor by novel B7 family member leads to negative regulation of lymphocyte activation. J Exp Med. 2000; 192:1027-34. 11.Dong H, Zhu G, Tamada K, Chen L. B7-H1, a third member of the B7 family, co-stimulates T-cell proliferation and interleukin-10 secretion. Nat Med. 1999;5:1365-9. 12. Latchman Y, Wood CR, Chernova T, et al. PD-L2 is a second ligand for PD-1 and inhibits T cell activation. Nat. Immunol. 2001；2：261-268. 13. Tseng SY, Otsuji M, Gorski K, Huang X, et al. B7-DC, new dendritic cell molecule with potent costimulatory properties for Tcells. J Exp Med. 2001;193:839-46. 14. Thompson RH, Kuntz SM, Leibovich BC, et al. Tumor B7-H1 is associated with poor prognosis in renal cell carcinoma patients with long-term follow-up. Cancer Res. 2006;66:3381-5. 15. Brahmer JR, Drake CG, Wollner I, et al . Phase I study of single-agent anti-programmed death-1 (MDX-1106) in refractory solid tumors: safety, clinical activity,pharmacodynamics, and immunologic correlates. J Clin Oncol. 2010;28:3167-75. 16. Topalian SL, Hodi FS, Brahmer JR, et al . Safety, activity, and immune correlates of anti-PD-1 antibody in cancer. N Engl J Med. 2012;366:2443-54. 17. Brahmer JR, Tykodi SS, Chow LQ, et Safety and activity of anti-PD-L1 antibody in patients with advanced cancer. N Engl J Med. 2012;366:2455-65. 18. Hamid O, Robert C, Daud A, et al. Safety and tumor responses with lambrolizumab (anti-PD-1) in melanoma. N Engl J Med. 2013;369:134-44. 19. Naidoo J, Page DB, Li BT, et al. Toxicities of the anti-PD-1 and anti-PD-L1 immune checkpoint antibodies. Ann Oncol. 2015;26:2375-91. 20. Wallin J, Bendell JC., Funke R. et al. Atezolizumab in combination with bevacizumab enhances antigen-specific T-cell migration in metastatic renal cell carcinoma. Nat Commun. 2016; 7:12624. 21. Tan S, Zhang H, Chai Y, et al. 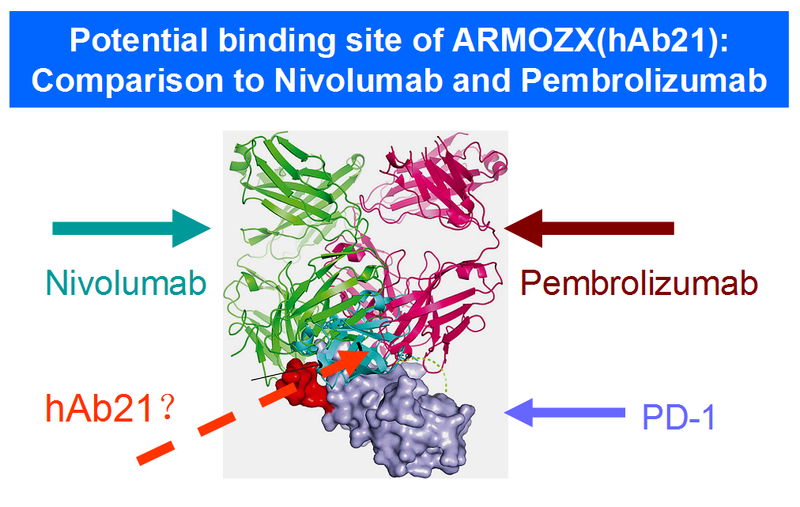 An unexpected N-terminal loop in PD-1 dominates binding by nivolumab. Nature Comm. 2017; 8: 14369.